Bollywood celebrities gathered at Zee Cine Awards 2018 in Mumbai. 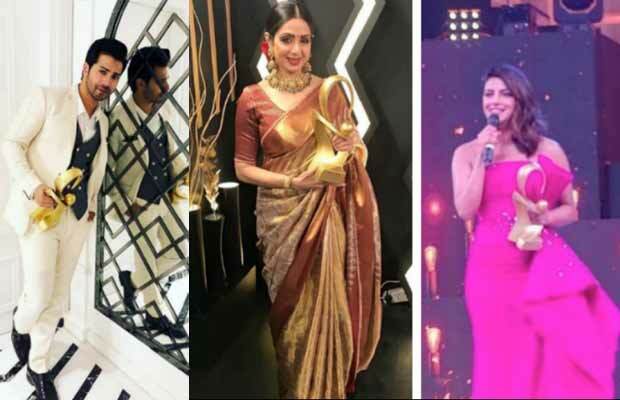 Bollywood celebrities gathered at Zee Cine Awards 2018 in Mumbai. Shah Rukh Khan, Ranveer Singh, Alia Bhatt and others graced the grand night. The whole Bollywood fraternity came together under one roof to celebrate the best of their hard work at the recently held Zee Cine Awards 2018 in Mumbai. The gala night had the crème de la crème of Bollywood under one roof. From Priyanka Chopra to Shah Rukh Khan, Alia Bhatt, Varun Dhawan, Ranveer Singh and many others showed their presence. The grand night also witnessed rocking performances by Ranveer Singh, Priyanka, Katrina Kaif, Shahid Kapoor among others. Talking about big wins, the ‘Best Film’ award was conferred to Rohit Shetty directorial comedy ‘Golmaal Again’. While Alia Bhatt bagged the Viewers Choice Best Actor (Female) for Shashank Khaitan’s Badrinath Ki Dulhania, Viewers Choice Best Actor Award (Male) went to Akshay Kumar for Jolly LLB 2. Varun Dhawan, who walked away with the trophy of Best Actor Male for Badrinath Ki Dulhania, took to his Twitter handle and expressed his happiness on winning the award. Superstar Shah Rukh Khan got special honour for his contribution to the Indian Cinema and TV for 25 years. On the other hand, Priyanka Chopra was honoured with Global Icon Extraordinary Award. Pics: @akshaykumar sir looked breath takingly hot at #ZeeCineAwards2018 last night in Mumbai. ? Previous articleWatch: Shah Rukh Khan Gets Emotional Looking At A Glimpse Of His 25 Years Long Journey In Cinema! Next articleAnushka Sharma’s This Co-Star Had No Idea Of Her Wedding With Virat Kohli!